Please, please, please, dear cousins. Please share your AncestryDNA autosomal testing data with your cousins. Yes, I have tested with AncestryDNA. Yes, I know that you and I match as second or third or fourth cousins there. Yes, I know your family tree data and my family tree data seem to be pointing in a direction towards a match in this line or in that line. But what neither of us can tell using the AncestryDNA site is… is that the right line? The problem is that you and I might have it all completely wrong. Your tree, or mine, might be in error. We’re cousins, yes, but it may be in — say — the Robertson line and not the Jones line. Or the Cottrell line, not the Pettypool line. 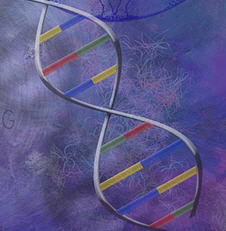 • How much overall DNA do you and I have in common? Are we at the high end or low end for second cousins? Are we really as likely to be second cousins once removed? Should we be looking a generation away for the common ancestors? • How big are the DNA segments we share? The bigger the segments, the more likely they are to be the result of actual shared inheritance, and not simply the roll of the genetic dice. Some segments are just too small to be meaningful. • Where are the segments we share, on what chromosomes? You and I aren’t likely to be cousins in the Robertson line if you and I don’t share any segments with any of my many Robertson kin who’ve tested. We may need to look at other possible lines to find our common ancestors. So please… please, dear cousin. Share your actual testing data. There are two ways to do it, and both — at a basic level — are free. First, please upload your data to the website GEDmatch.com. I wrote about GEDmatch back in 2012 and even then called it a DNA geek’s dream site. The only thing that’s changed since 2012 is that there are now some additional, fee-based goodies if you’re willing to pony up a little cash that I’m just starting to play with. But the overall basic functionality is still free. And it lets you really analyze your DNA results against those of others who’ve also chosen to upload to GEDmatch. Read more about GEDMatch in my 2012 blog post here or in Kitty Cooper’s blog post here. And second, please upload your AncestryDNA autosomal test data to Family Tree DNA. What’s called the Autosomal Transfer Program has two flavors, one paid and one free. The paid option, which only costs $39, is by far the better choice, but even the free one can get you started. Family Tree DNA is a genetic genealogy DNA testing company that does autosomal testing as well as YDNA and mitochondrial DNA testing. What it offers that AncestryDNA doesn’t for autosomal testing is analytical tools. There, you can see how much DNA you have in common, how long your shared segments are, what chromosomes they’re on, who else you and a match share as a common match, and more. These are, really, the basic building blocks of using autosomal DNA data as part of good genealogical research. The transfer system is explained on the Family Tree DNA website here, and there’s more that’s been written about it that you can read at, for example, Roberta Estes’ DNA-eXplained blog here, or Blaine Bettinger’s The Genetic Genealogist post here. See, I really do want to work with you, cousin. But we can’t just click on shaky leaves. We need to look at the data. So… share with me, okay? AMEN! Preach on Rev. Russell — even if you are mainly preaching to the choir. Trying to talk with the powers that be at Ancestry for the last couple of years has fallen on deaf ears of those who are convinced they know better what we need than we do. Do they really have a better mouse trap in mind or do they not know how to give us more tools? Two of my most genealogically useful atDNA matches have occurred at Ancestry. One of them I was only able to understand after I used the xDNA comparison tool at GEDmatch. I can only wonder how many useful matches I may have there that are hidden in locked pedigrees or no pedigree trees at all. There is a lot of potential ther that goes untapped. If there’s even one critical match that’s being missed this way, it’s one too many for me, Dave. I actually updated my Ancestry bio asking DNA matches to transfer to either site for free. I made the point that with other cousins over at those sites, we may be able to figure out common relationships. I kept the message simple so as not to overwhelm them with science stuff they may not want to learn. Very good idea, on both counts, Christie (the post and the keep it simple parts!). I receive on message with very little information, just saying I might be a cousin of her husband. Had no idea what this woman was saying, so I would suggest you give more detail as what it is pertaining too. I still have no idea how to get my raw DNA from Ancestry. You can find step by step directions on downloading AncestryDNA raw data here: https://www.legalgenealogist.com/blog/2013/05/05/going-raw-and-banking-dna/. Asking folks to use GEDmatch is a tall order. I love GEDmatch, but transferring to GEDmatch from AncestryDNA is no piece of cake. Starting with the process of downloading the raw DNA file from Ancestry, there’s a byzantine series of hoops to jump through. GEDmatch can a bit intimidating as well. You have to sign up even before you get to see the website. That turns some people off. Too bad ancestry hasn’t figured out a way to provide useful tools at their own website. We still have hopes for the future, Jason, but for the time being yes we all are going to have to work a little harder to get what we’d like to get from our autosomal results. Can you upload Ancestry to FTDNA and then upload to Gedmatch from FTDNA. If that’s possible, wouldn’t it be easier? It’s actually pretty easy to upload from any of the services, so I’m not sure it’d be easier to upload from FTDNA than from Ancestry. Judy, this is a good post. Since Ancestry is reluctant to admit there is a problem with their protocol for asking people to share trees, this would be a solution. In the past three months, requests to share appear to disappear into nothingness. When Customer Care is contacted about this, the standard response is to point fingers at ISPs. Blaming someone else seems to be the great American sport these days, doesn’t it, Connie? Sigh… so very frustrating. But yes. I’m going to sit down and write up a note to all my key matches on AncestryDNA and send it to them. I agree with Connie regarding messages on Ancestry. I called them to question whether there was an issue, and twice I was told they have been having difficulties with their system and not all messages are getting delivered. It’s very frustrating. You do not know whether you are being a pest, or are the just ignoring you or worse, they have never seen your messages. Of course, but be aware that the internal communication system at Ancestry is often not working as designed. It may just be that some of these messages are never being received. I just got my results back…exciting! I’m in the process right now of uploading to GEDmatch and Family Tree DNA. I’m also searching for anywhere else I may be able to find cousins. Casting the net as widely as possible is a great idea! but i regretted spending money on transfer to ftdna. I’m sorry you regretted it. The additional tools are so valuable to most folks.